One of the major factors in a road trip is choosing the right vehicle. While people may think that the road trip requires a large vehicle that has a ton of people in it, there are actually other vehicles you can use if you are going to take a road trip with very few people. 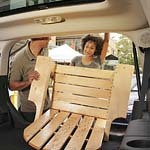 When choosing a vehicle to go on a road trip in, one of the most important factors to consider is the capacity. This is so that you can pack the vehicle with everything you intend to take on a road trip and still make it safe for people in the vehicle. Another thing to consider is fuel economy. For one thing, you are going to be driving a lot on the road trip. Therefore, you are going to have to make a lot of stops to fill up the fuel tank so that you can keep going.